Although this book at its core is a coming-out story, most of the middle section looks at it from a broader perspective - the issues of trust, having secrets, and to what degree people can have a sense of privacy. Ted is fully out to his friends and family, but not to the rest of his superhero team, the Extraordinaires, who don't even know he's been dating. Secrets are everywhere; it's difficult to juggle them all. Some superheroes don't talk about their backgrounds or personal lives, some don't reveal the true nature or extent of their powers, some don't show themselves outside of their costumes, and some don't share their real names except with the closest of friends. Almost all keep their everyday identity separate from their superhero guise. At the same time, because their powers come with such heavy responsibility, a lot of their personal information is on file, so they don't always get to control what's private. When Ted requests Alpha clearance for Jay, Jay will receive protection from the team, but it also means his life, background and character will receive intense scrutiny, and he'll have to uphold difficult secrets as well. 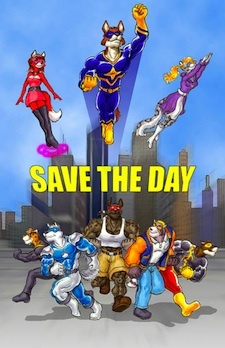 This is a lot for a regular person to deal with, and Jay becomes part of an unofficial Alpha club - the superheroes' closest friends and companions - a kind of social and support group. Who else are you going to be able to talk to, when you realize that one day your best friend may get unexpectedly killed? This is a novel that takes its time. Nothing is rushed, from writing about the characters going out to dinner, or battling evil-doers. Sometimes I liked this, especially being able to follow the characters' thoughts during a fight. At other times it was very slow and made me wonder what plot elements were going to come up again, versus what felt like extra-detailed character-building. It's just shy of 350 pages and must be at least 150,000 words long. One reason I admire Fred's reviews is the sheer variety of material he's able to cover. My own online reviews are definitely eclectic, but at the same time, some of my interests are narrower. This limits what I feel I can cover, because I want to stay fair to the material. It's also a good idea to occasionally challenge one's boundaries. For example, I've always been very anti-Disney, but every so once in a while they surprise me by making movies I can smile at respectfully (like Enchanted or Tangled) even if I'll never fawn over them. And sometimes you experiment with your boundaries, only to find that, well, you still have them. Case in point, I was so over-exposed to coming-out stories in the late 1980s and early 90s (even before my involvement in the fandom) that it's very difficult for me to enjoy the genre and avoid nit-picking. Likewise, being bullied by jocks during my childhood made me unable to appreciate most sports stories. So when Kyell Gold sent me an advance copy of Green Fairy to review - it's both a coming-out and a sports story - I really tried, but my review was so lacking in objectivity, there was no way I could post it here in good conscience. Attempting to review Save the Day likewise gives me warning pangs; I feel you shouldn't entirely trust my opinion, as I'm not the best person to be reviewing it. Still, the reading experience was quite tolerable. Why the difference? I'm not sure – maybe because I used to read Marvel comics. For me, it's important to be honest and let you know when I think my biases are coming into play - whether it's something I have a soft spot for (OMG I LOVE WOLVES), or against. Timing-wise, this also follows on the heels of Crossaffliction's review of Brave, which he began with his outright antipathy towards Pixar. Speaking personally, it didn't feel particularly useful as reviews go – not because it was negative, but because I wanted a better understanding of what buttons of his were being pushed, and the context of where he was coming from. Some of that was present, but it felt like there was missing information, so all I was seeing was the surface reaction, not the bubbles that led up to it. Anyway, in the comments here, I'm really interested in hearing your opinions about the nature and difficulties of reviewing. I will say, however, that one of the things about coming-out stories that really annoys me – angst – is on the light side here. I think this is the main reason why I got a decent read out of it. There's understandable worry and concern on the part of the main characters, and it felt realistic (if occasionally misplaced). At worst, Ted gets badly telepathically zapped at one point and has to deal with his sense of self-worth, but it's not his sexuality that's driving his mood, it's worrying about the decisions and mistakes he's made in his past. The rest of the team have been zapped by the same villain before, and they know he'll need some time to get over it, and Jay is very supportive. Jay is the ideal boyfriend for Ted, and to be honest, suffered as a character because of it. He's a good fellow and everything, but his flaws were negligible, and he was, well, kind of boring. A good narrator though. The story progresses through a series of escalating encounters with bad guys while also following Jay and Ted re-adjusting to their relationship. Tensions are also building within the Extraordinaires, while their Alphas continue to cope as best they can. The superhero team dynamics and their ability to cooperate are still being figured out, and this felt very natural. Occasionally Jay and Ted hang out with their best (gay non-superhero) friends, inviting Ted's closest superhero buddy on the team to come along too (as a regular person). There's also the occasional illustration by Vince Suzukawa, with a beefcake emphasis on huge muscled forearms and chests. Not my thing. Unusually for a coming-out story, there wasn't a significant homophobe present. In fact, the one character who briefly takes issue with Ted's sexuality isn't doing so because he's gay, but because the inevitable public-relations fallout will need to be carefully handled; and he turns out to be completely right. Another character (Paul) seems to be being built up to be the open-minded straight guy who decides to become gay (another cliché of the trope I've gotten tired of) – except his part in the story never completes that arc, making me question the entire necessity of chapter 11. Is it there to show how open-minded straight guys can be? Did Paul or the flaming gay stereotype side-character need more depth? Or was it there to establish a location that only gets briefly used again near the end? There's also something a little odd about the flow of the text – but my sense of grammar is terrible, so I don't think I can objectively comment about that, except it could have used more commas. I do think that the writing style could have used a little more polishing. After the opening pages, either it got better or my brain acclimatized. The first couple of chapters, however, are incredibly long and would have benefitted from being split up into shorter segments. Additionally (and this is definitely due to my biases) I really had to force myself to keep reading at the start. By the time I got about two-fifths of the way into the book, then it hooked me and it was hard to stop reading. So a bit of a late start, but the momentum happened nonetheless. As for the ending – my biases again, and I'll minimize spoilers – the issues surrounding secrets and trust (the things that had kept me interested) were set aside, and it returned to being a coming-out story in full force. Ted reveals his secret, a conflict arises against a group of homophobic jerks, a couple more people turn out to be LGBT too - I've seen it way too many times before. And did it occur to anyone that the last-minute technology that drives the climax has incredibly dire implications against privacy and civil rights, in direct opposition to the gay-positive ending? I don't think the technology's social repercussions were fully thought out beforehand. Still, I like a happy ending, and everything working out for Jay and Ted gave me a warm fuzzy feeling inside, so good work there! Final thoughts – Fahl has a lot of potential as an author, and he's obviously putting a lot of effort into his work. I think he needs to tighten and focus his writing style. Furry-wise, all the characters could easily be human, though there's a good deal of tail-wagging mixed in with the body language. Story-wise, as you can tell from my review, there are things that just don't work for me on a personal level. "Right," Brian grimaces. "Well anyway I get to his apartment and knock. No one comes to the door so I go in and wait for him. He gave me a key after all, and what do you know? He sneaks in through his own window. I didn't know it was him of course, and I'm a cop. All I saw was a mask climbing through a window. I pull my gun and badge, he moves towards me without identifying, and I sort of, well, I shoot. Of course the second he hears a bang, the guy turns into pure metal, so I find out about his secret." "By shooting him?" I say, quirking an eyebrow. "Hey, it works," Bran chuckles a rich bass sound as he eats some fries. "After the mutual shock I got the details." Adam grins, "Oh that is a fun one. I still like how Emma told me." "Well, proposing to a young woman and having her say no because she can create force fields is a surprise," Stuart says. "I still say that was very romantic," Diane says with a grin. "Besides, she said yes in the end." "Fifth time is the charm I suppose," says Stuart with some amusement. Is it worth reading? Depends how you feel about superheroes and coming-out stories. For my part, it's not usually my thing; but like the occasional Disney film, it managed to surprise my preconceptions. It's a decent story, and I feel I can recommend it; I just don't think that my review is entirely objective. If you've read Save the Day, please leave a comment here to give us your perspective! I appreciate this review and how fair you were in it you've certainly given me a lot to think about as I craft the sequel (Tales of the Extraordinary). Thank you!